1937. "...with or without Slide Fastener Closing"
McCall pattern illustrations of this period are incredibly lush. The models' faces seem like pure Greta Garbo to me. And indeed, Garbo was nominated for an Academy award in 1937 for Camille, which was released in 1936. The total look however, brings to mind Kate Hepburn. 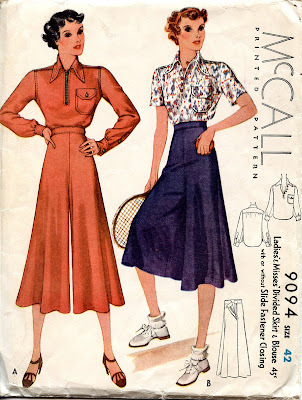 Slide fasteners (Zippers in the United States now) were new in the mid 1930's, and McCall is doing a nice job of marketing them here; they appear on both the blouse and the skirt. They're appropriate for a casual outfit because at this time they tended to be rather heavy and stiff, so weren't yet suitable for fine clothing. The suggested fabrics listed on the back of the envelope include linen, pique, knitted fabrics, percale, gabardine, flannel, and wash silks. Included in the envelope is a collar cut from the May 28, 1937 evening edition of the Ogden (Utah) Standard-Examiner. It's been cut about a half inch narrower than the original collar pattern piece. very interesting pattern, do you think you'll make it up? I'm considering the shirt because I need a few new short sleeved shirts for the summer months. Definitely Hepburn. She was famous for wearing pants.